Kevan joined VAL in September 1990 having been recruited to the post of Director from his previous role at St Matthews Tenants Association. He joined a vibrant but small organisation that shrank to having only 10 staff within a year of his arrival (as the planned separation of the Leicester Volunteer Centre was completed). From that point in 1991 he has steadily built the reputation and size of VAL to the organisation it is today. He managed the ‘re-merger’ with the Volunteer Centre, and the strategic decision to purchase and move into 9 Newarke Street. He led the fundraising of the £1 million required to complete the building refurbishment and establish VAL as a critical partner in the City. Then he led the strategic expansion of VAL into Leicestershire to provide the benefit of VAL’s experience and expertise to county organisations and volunteers. 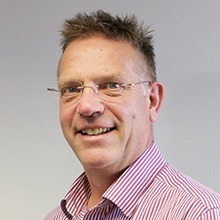 In recent years Kevan has also overseen a growth in VAL’s direct service delivery in Children’s Services, Learning Disability and most recently the new Healthwatch schemes for Leicester and Leicestershire. VAL now has nearly 90 staff, and asset worth £2 million and annual income of £3 million. In 2015 Kevan will have been the Leader of VAL for half of its 50 year history. Kevan is a Biology graduate who’s first job was manufacturing electrical parts for cars for Lucas in Birmingham. He held a series of production management posts in Unilever, Duracell Batteries before ending his manufacturing career with Avon Cosmetics in Corby. In 1985 he took up a temporary post as a Social Work assistant in the Belgrave Area of Leicester as he had become more interested in working directly with people. After some time as an unqualified Social Worker he studied for the Masters Degree in Social Work at Leicester University, and it is during this course that he discovered the ‘delights’ of the local voluntary sector. Soon after qualifying Kevan was successful in gaining the post of Liaison Officer for the St Matthews Tenants Association, and whilst at St Matthews he helped to raise the profile of the estate and develop new local projects such as The What Cabin and St Matthews Elders project. Kevan lives in Leicester, although he is an expatriate Welshman, and is a passionate rugby supporter. He has three children and one grandchild. He has been a school governor, chair of a local Football Club, part time youth worker and active volunteer. He has been involved in many partnership initiatives in Leicester and Leicestershire – championing the role of local voluntary groups and the importance of volunteering.